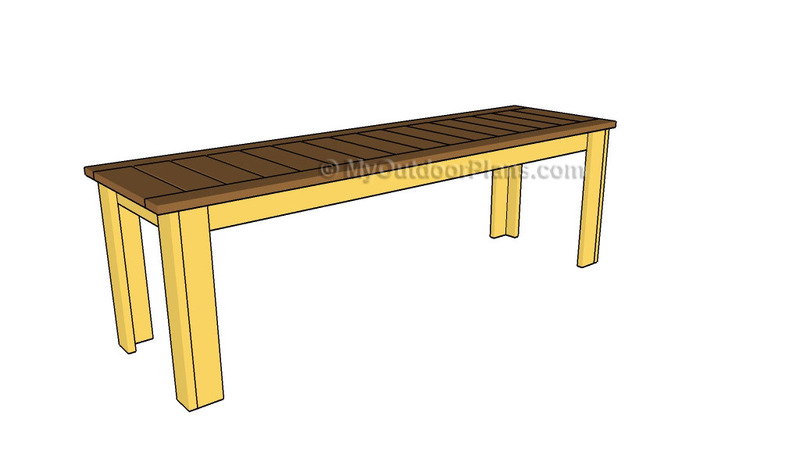 This step by step diy woodworking project is about 2×4 bench plans. 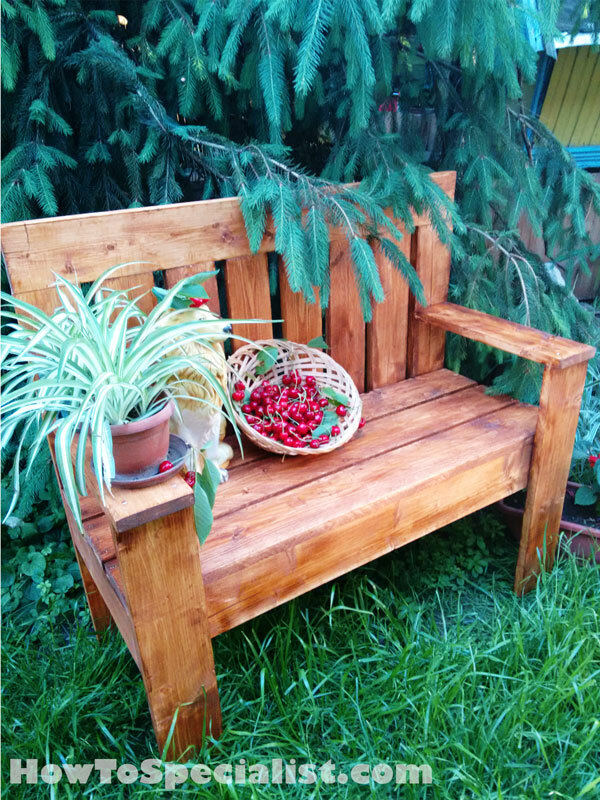 If you want to learn more about building a nice bench that could be used inside your home or outdoor, we suggest you to pay attention to the instructions described in the article. I have teamed up with Jack from HowToSpecialist.com for this project. You can see his step by step tutorial for this bench here. 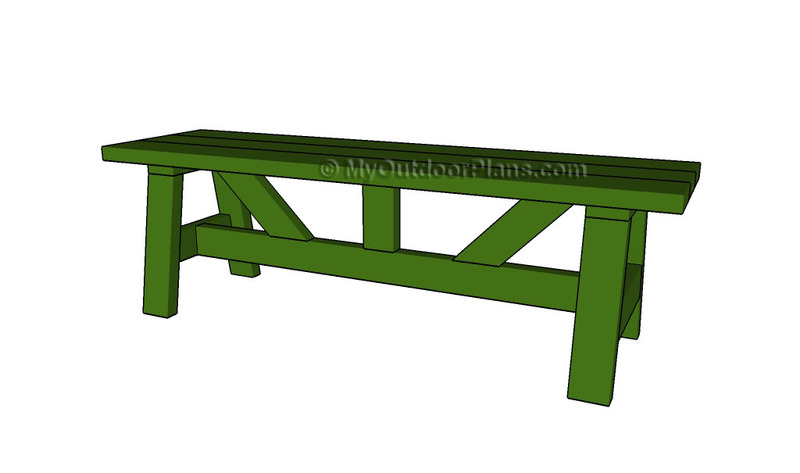 It’s that easy to build a 2×4 bench! The first step of the project is to assemble the seat frame for the 2×4 bench. Cut the components at the right dimensions and smooth the ends with sandpaper. Drill pocket holes at both ends at both ends of the 45″ long components and insert 2 1/2″ screws into the perpendicular slats. Make sure the corners are square and add glue for a proper bond. Drill pocket holes at both ends of the middle support and insert 2 1/2″ screws into the seat frame. 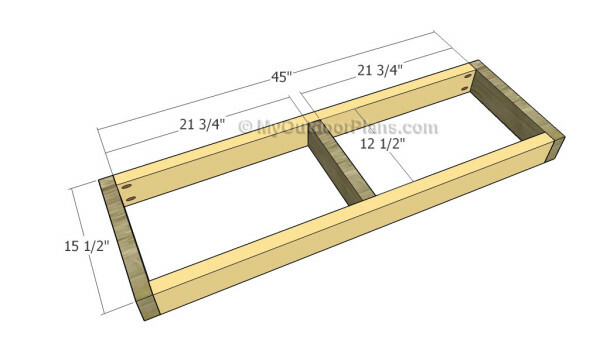 Next, you need to attach the 2×4 slats to the frame. Align the edges with attention and make sure the slats are equally-spaced. Drill pilot holes and insert 2 1/2″ screws to secure the slats into place. 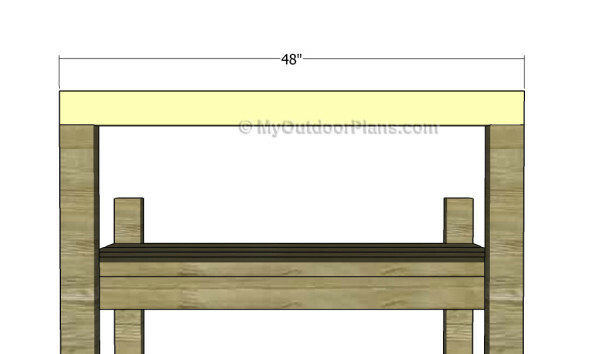 You can place a 1/2″ wood blog between the slats to get a professional result and equal gaps. 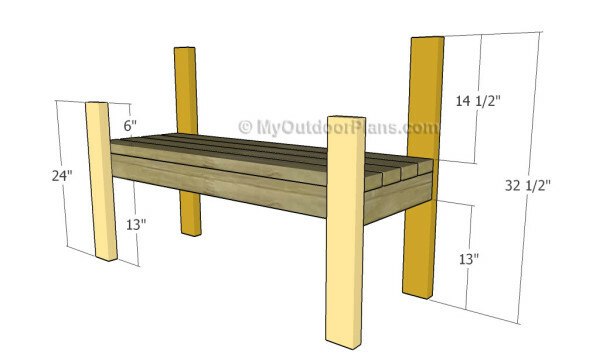 Cut the legs at the right dimensions, using 2×4 lumber. Fit the legs to the seat, drill pilot holes from the inside and insert 2 1/2″ screws into the legs. Make sure the legs are plumb before inserting the screws. Drill pocket holes at the top of the back legs. Attach the top component, making sure the edges are flush. Insert 2 1/2″ screws to lock the components together, leaving no gaps. 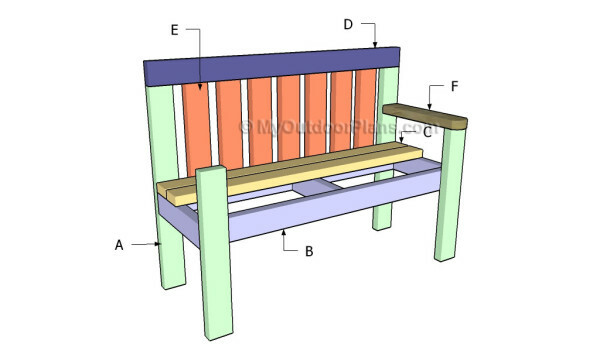 Building the backrest for the 2×4 bench can be done in a few ways, but the most straight-forward would be to attach vertical slats to the frame. Drill pocket holes along the top of the slats and insert 2 1/2″ screws into the fame. You can adjust the gaps between the slats according to your needs, by placing more or less slats. One of the last steps of the project is to attach the 2×4 armrests to the bench. 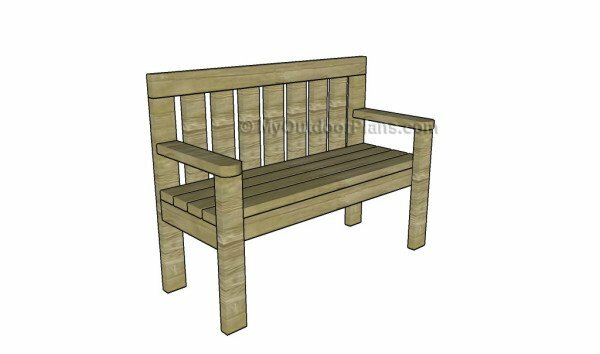 If you want to enhance the look of the rustic bench, we strongly recommend you to round the armrest using a jigsaw. Smooth the edges with sandpaper. Use 2 1/2″ screws to secure the armrests to the frame of the bench. Drill pilot holes through the armrests before securing them to the frame, to prevent the wood from splitting. Top Tip: If you want to enhance the look of the woodworking project and to protect the bar stool from decay, we recommend you to cover the components with paint or stain. My friend Jack from HowToSpecialist.com built this amazing bench using my plans. If you like the plans take a look over his tutorial to get a better understand of the project. I would love if you pin, like and share my projects with your friends. 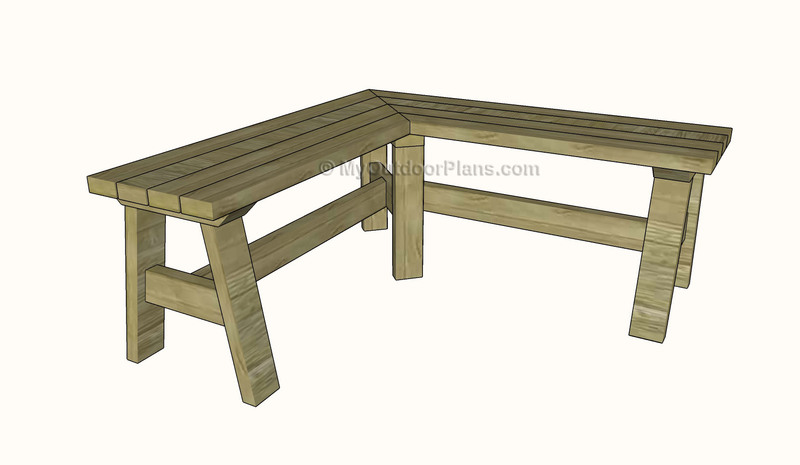 This woodworking project was about 2×4 garden bench plans. If you want to see more outdoor plans, we recommend you to check out the rest of our step by step projects. LIKE us on Facebook and Google + to be the first that gets out latest projects. What if i don’t know how to do the pocket screw thing? Is it possible to just screw the board the normal way or will the wood split? Thank you. It will work if you drill pilot holes before inserting the screws. In addition, the head of the screws will be exposed, but it will work. that’s the thing, i’ve never drilled pilot holes so was trying to avoid doing it that way. I guess i’ll research what i need to buy and practice. Thank you. I said pilot holes, not pocket holes. A pilot holes is a simple holes you drill before inserting the screws, nothing complicated. If you were to use pocket holes you would have needed a jig, but for pilot holes you only need a drill and a bit. Sorry to bother you again…the back slats say 1×4…is that correct, or should it be 2×4? You can use either one. If you use the 1x4s you will decrease the weight of the bench. Other than this, there is no difference between the two alternatives. Thanks Julian.. I was just making sure i wasn’t missing something. Glad I could help. Looking forward to seeing your projects. I think it should work, but I would add more 12 1/2″ supports to the seat frame. 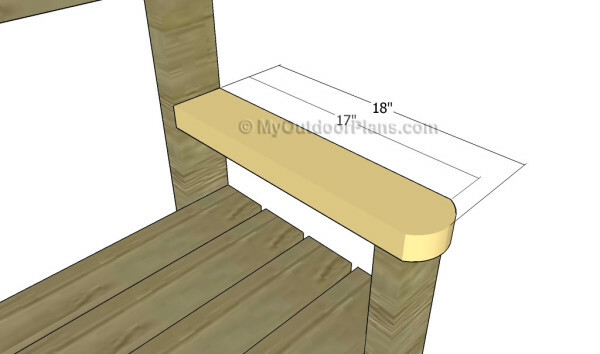 I THINK IS INTERESTING YOU PROVIDE PLANS FOR A 2X4 BENCH, BUT IN THE FINAL PICTURE YOU SHOW US A BENCH MADE WITH 1X6’S INSTEAD. DO YOU NOT REVIEW THESE LAYOUTS? OR WAS THIS INTENTIONAL? Yes, it’s international so the lumber dimensions don’t match perfectly. 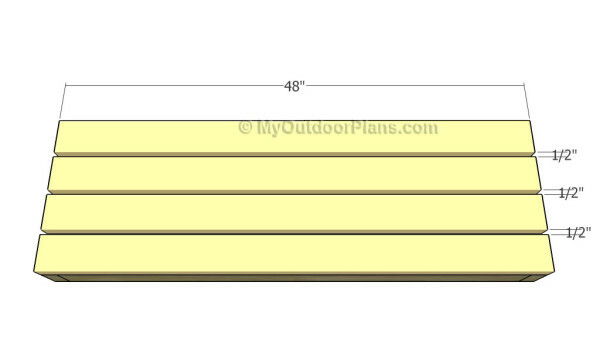 However, you can see at the “Made from This Plan” section… a lot of brag projects completed using 2x4s. In the same way the legs are attached to the seat frame. The backrest slats are parallel to the back legs. Great little afternoon project. I precut everything, then drilled all the pocket holes, assembly time from cuts to screwing was about 3.5-4 hours. I love it, and it is sturdy and will get a lot of use from us. don’t know how to load pictures of the finished product for you. Thanks. That sounds awesome. You can send pics using this form: http://myoutdoorplans.com/contact/ or you can send them directly using my mail: [email protected] Looking forward to seeing it and featuring it on the site. Hello. I’m not in the slightest experienced with outdoor projects. I was thinking about working on this project, but looking at the materials needed and looking around the lowe’s website, it appears the materials would be worth well over a thousands. Maybe I’m looking at a different wood type or using the wrong terms, but if you could show me where you found the price to be under $15, it would be greatly appreciated. If you use regular lumber, no hardwood, you will get close to that number. Hey i love this bench. 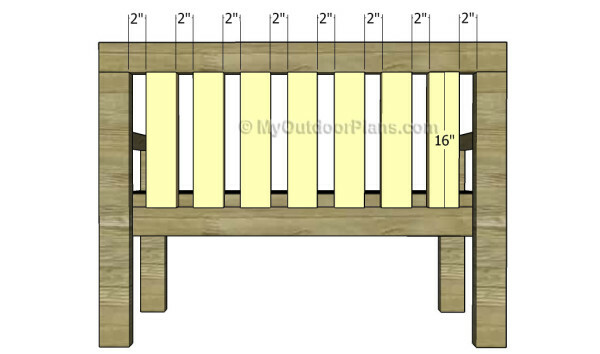 I’m trying to figure out the measurements for a bench that needs a seat height of 25 inches. I made a few of these for Christmas gifts. I love the plan. I would like to make a child sized one. I’m thinking of using 2×2’s instead of 2×4’s what would be a good hight for that?